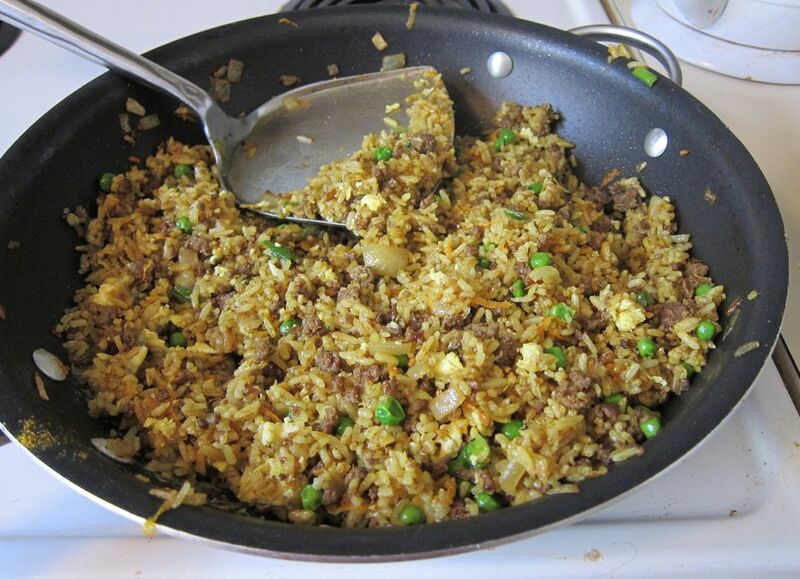 Marinated ground beef and curry powder add extra flavor to rice in this easy fried rice recipe. It’s a great way to use leftover cold rice, and the whole recipe takes less than 30 minutes to make. You can garnish the dish with green onions, spring onions or scallions to add a pop of color to the finished dish. Place the ground beef in a bowl and add the marinade ingredients, adding the cornstarch last. Marinate the ground beef for 15 minutes. Prepare the other vegetables while the meat is marinating. Add the oil to a wok preheated on high heat. When the oil is hot, add the ginger slices, and stir-fry for about 30 seconds. (This is to flavor the oil). Remove the ginger slices. Add the ground beef to the wok and cook, using a spatula to break up the pieces, for 1 - 2 minutes, until it changes color. Add the chopped onion. Stir-fry for 1-2 minutes until it starts to brown and soften. Turn the heat down to medium, and add 1 tablespoon of curry powder and stir briefly until it becomes aromatic. Add the rice, stirring and turning it over with a spatula to heat through and break up any clumps. Stir in more curry powder if desired (approximately another 1/2 tablespoon). Add the peas and the shredded carrot and combine thoroughly. Make a small amount of room in a corner of the pan and add the beaten egg. Scramble the egg and then stir to mix in with the rice. Stir in the scallion. Season with salt and pepper if desired. Serve hot.